So you’re planning a DIY project this spring? What better way to get rid of waste than to hire a domestic skip from Chorley Skips? Here at Chorley Skips, we provide a large variety of skips, starting from 2-cubic yards and ranging right the way up to 40-cubic yards. Prices vary depending on the size of the skip and the location, however, we can help you to choose the right size skip, saving you time, effort and money. Whether you’re looking for skip hire in Chorley, Bolton, Leyland, Preston or Wigan, you need to be mindful of the scale of your project and how much waste you expect to produce. The smallest skips we have available. They are ideal for projects that generate a small to moderate amount of waste, take home renovations or kitchen refits for instance. To help you visualise the size of a mini skip, they’re perfect for storing up to 30 bin bags of rubbish, 4 wheelie bins and 1 sofa – making them surprisingly spacious. If you’re undertaking a bigger project, you may consider one of the 4-cubic yard skips we supply for skip hire in Bolton, and all other surrounding areas in Greater Manchester and Lancashire. These domestic skips are best-suited to large-scale renovation projects as they provide twice as much storage space as the mini skips. Maxi skips are often the preferred choice of builders – hence why they are sometimes called ‘builders skips’. Our maxi skips come in useful for projects that produce soil, rubble or garden waste because they have drop doors which make it easier for you to dispose of messy materials – keeping your premises clean and tidy. They can fit up to 80 bin bags, 16 wheelie bins and 4 sofas safely, without exceeding weight restrictions. For projects expected to produce a significant volume of waste, one of our open skips is ideal. They’re designed to accommodate various materials, ensuring that they are kept off the ground and stored safely when on your site. Fitting more than 100 bin bags of rubbish and 6 sofas, the 12-cubic yard skips for skip hire in Leyland and skip hire in Preston are guaranteed to suit large-scale projects like property moves and clearances. The largest domestic skips we supply at Chorley Skips are the 16-cubic yard open skips. Picture 160 bin bags of waste, along with 48 wheelie bins and 8 sofas. This is how much you can fit inside the 16-cubic yard skip, so if you’re expecting your project to produce a similar amount to this, then order yours today. 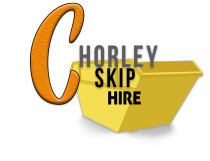 If you need to know more about any of the skips we provide for skip hire in Wigan, Preston, Leyland, Bolton or Chorley, be sure to call us on 01257 475 300 or email us at info@chorleyskiphire.com.